The first session of Thursday evening qualifying had been suspended after just seventeen minutes following heavy impact into the barriers for Erik Maris in the Eurasia Motorsport Ligier. When action resumed at shortly after eight, it was not without further drama, but this time of the right kind …. 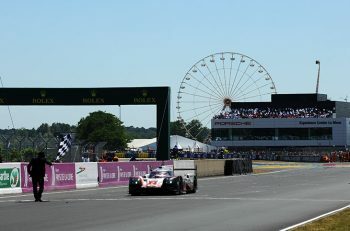 Earlier in the day we’d witnessed plenty of track action – a second practice session, two qualifying sessions and a 55-minute race for the Road to Le Mans grid, as well as three period on-track for the Porsche Carrera Cup – meant there was nothing ‘green’ about the circuit when the second session got under way at seven o’clock. The weather has continued to offer its own challenges, with the official track temperature recorded as 36.7 degrees beneath an ambient 27 degrees centigrade. 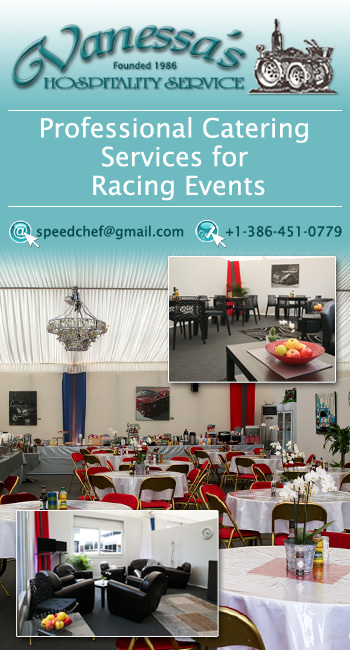 Come raceday, conditions within enclosed cockpits at the end of ten or twelve laps stints could be sauna-hot and sticky, but even during qualifying teams have had to be wary of the new regulations on cockpit temperatures. The pitlane opened on time, and the first cars streamed out onto the circuit. 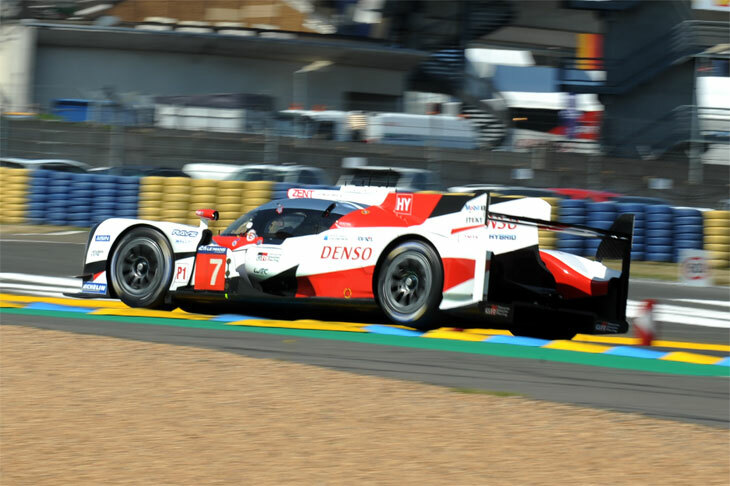 It looked to be a typical start to Le Mans qualifying, but not so for the #8 Toyota, which crawled to a stop after exiting the second Mulsanne chicane. Buemi was seen sitting disconsolately at the wheel and awaiting instruction. On-board footage showed an almost instantaneous loss of drive. The Swiss driver restarted the car and crawled his way back to the pits. Faring far better was Dominik Kraihamer, who was making significant improvements aboard the ByKolles ENSO, shaving nearly 3 seconds off the car’s best lap times to post a 3:26.026 – evidence of much better progress with the car which, although unsurprisingly at the bottom of the LMP1 times, has not disgraced itself. There were mixed fortunes for Jackie Chan DC Racing. Thomas Laurent had set a new LMP2 qualifying lap record in the #38 car by crossing the line in 3:26.776, eclipsing last night’s best for the class by three seconds. The sister #38 car however was moving slowly through the Porsche Curves. After last night’s limited running, due to an oil pump failure, David Cheng appeared similarly compromised, and his slow progress caused several sharp intakes of breath as he was narrowly avoided by quicker machinery. 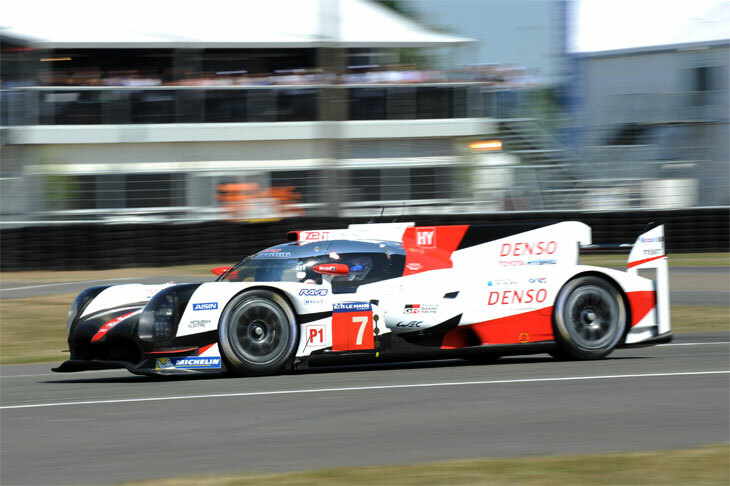 Meanwhile, Mike Conway had been setting a fast pace in the #7 Toyota, posting a new best of 3:18.651 with fifteen minutes gone and setting claim to provisional pole for the #7 Toyota. James Allen had just improved the time for the #40 Graff Oreca, moving to fourth in LMP2 with a 3:30.400, when Erik Maris took to the barriers on the exit of the first Mulsanne Chicane. The Eurasia Motorsport Ligier appeared to make heavy impact with the barriers, and the session was immediately red flagged. Race Control reported that Maris was to be taken to the medical centre as a precaution. The barriers had evidently taken quite a battering, and while we awaited news of Maris’s condition, Race Control issued a statement that track activity would not re-commence until 20:15, although in the end the pitlane re-opened at ten-past. 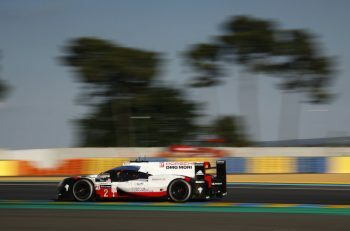 The news from Toyota during the suspension was that the #8 was having a precautionary engine change, having suffered an “engine oil supply issue” It was suspected that the car would probably not return to the track during the Thursday evening sessions. Subsequently we learned that the team had indeed started to remove the engine, but then discovered the source of the problem, left the engine where it was and started reassembly. Drivers were eager to get back out on track, and there was a lengthy queue – two wide – when the lights turned green, and it wasn’t long before their enthusiasm was rewarded. First it was Kobayashi, who wasted no time in getting up to full chat in the #7 Toyota. With a clear lap ahead of him, he hammered in an epic 3:14.791, shattering the previous qualifying lap record by more than two seconds. It was an imperious display; the car appearing perfectly poised as the Japanese driver swept through the final series of bends, smooth as a polished nut, to astonish all those watching. For a second or two the crew inside the Toyota garage appeared transfixed, gaping in awe at the timing screen, before leaping as one in jubilant amazement. It was always going to be hard to match that kind of performance, for sheer brilliance alone, but in LMP2 Vitaly Petrov were doing his best. 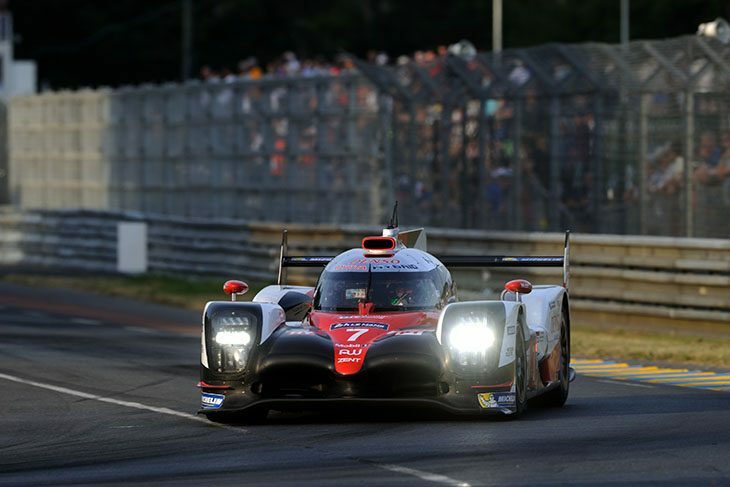 A 3:25.549 from the Russian was more than good enough to set the #25 Manor Motorsport Oreca back on provisional pole, slicing a further three seconds off last night’s updated class record for P2. It also placed the #25 sixth overall, ahead of the ByKolles LMP1 privateer. Somewhat ignominiously, the #25 would subsequently end up in the gravel on the outside of the first Mulsanne Chicane, in the hands of Simon Trummer, but the important work had been done. It’s worth noting that a new lap record in GTE Am for Dries Vanthoor in the JMW Ferrari #84 (see below) meant that three out of the four lap records had fallen within the first ten minutes of the resumed session. If they were slightly stunned by Kobayashi’s time, Porsche’s drivers showed little sign, and responded swiftly. The hard-chasing and improving #1 and #2 Porsches moved up to second and third, posting 3:17.259 and 3:18.162 respectively. The latter was improved to 3:18.067 as Timo Bernhard took over the #2. As impressive as these times might have appeared twenty-four hours previously, they fell well and truly beneath the shadow of Kobayashi’s astounding attack through the French countryside. Yuji Kunimoto had also improved the time for the #9 Toyota, although it remained the last of the LMP1 Hybrids, fifth overall. The clocks stood at half-eight as Matthias Beche moved the #13 Vaillante Rebellion up the timing screen to sit seventh in class with a 3:29.884, just three hundredths off its #31 team mate. Up ahead, second in P2 was held by Ollie Jarvis in the #38 Jackie Chan Racing Oreca from the second Manor entry; Jonathan Hirschi posting a 3:26.871 to secure 9th overall. The first of the G-Drives rounded off the top-ten. 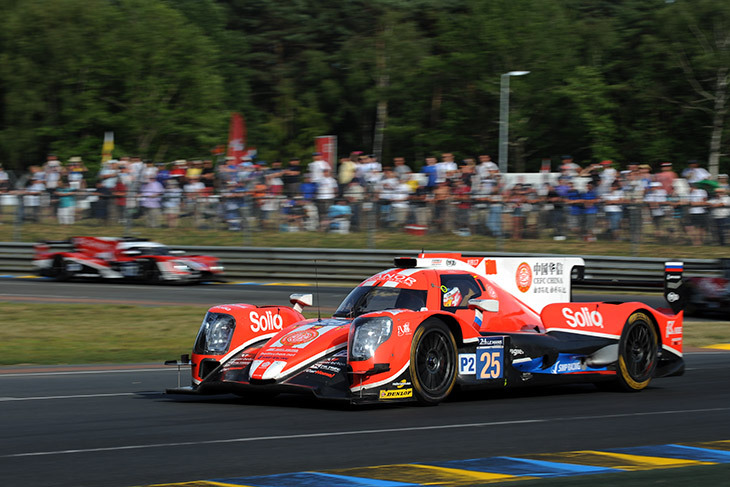 It was a while getting back to the pitlane, but at eight-forty the pole-sitting #25 Manor Oreca-Gibson arrived back under its own steam with no apparent damage. The crew pushed it backwards into the garage for closer inspection. A lap later and Roman Rusinov improved to fourth in the #26 G-Drive DragonSpeed with a time of 3:28.807, though he remained two seconds adrift of the top three. Bruno Senna clambered aboard the #31 Vaillante Rebellion while the front aero was tweaked and he headed back out on track. Whatever the engineers had done, it favoured the Oreca through the first sector, but must have proved less well suited to the second and third, prompting the Brazilian to return again to the pitlane for further adjustments. Nathanaël Berthon was also heading for the pits, the #23 Panis Barthez Ligier limping all the way from Mulsanne Corner with a puncture. Closing on the end of the hour, Matthias Beche posted a revised 3:28.387 for Vaillante Rebellion which elevated the #13 to fourth in class. With an hour yet to run, the top seventeen cars in LMP2 had all beaten last year’s class record. Needing to resurrect its performance the #37 Jackie Chan DC Racing Oreca now had Alex Brundle strapped into the cockpit and, with a clear track, the British driver looked quick and planted a 3:28.432 that took the car to fifth in class. However, this soon became a net sixth as Bruno Senna’s aero experiments seemed to be paying off; the #31 Vaillante Rebellion up to fourth. Further down the P2 ranks, Jose Gutierrez’s and Andrea Bellichi had improved to ninth and tenth in the #26 and #40 Orecas. With a little over half an hour remaining the red flags were waving once again, this time as a result of an incident for the #23 Panis Barthez Ligier. The car stepped out onto the grass on the run out of the Esses, Timothé Buret suddenly becoming a passenger in the JSP217. 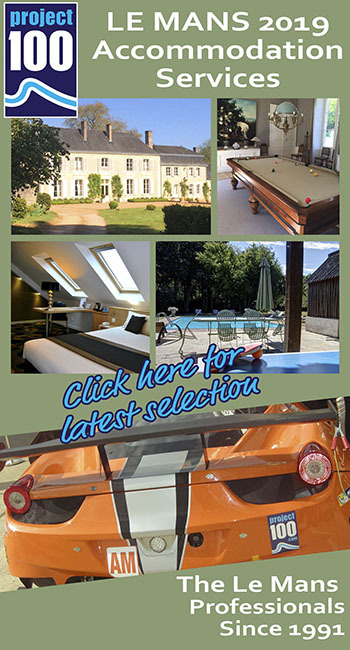 The car spun sideways before nosing heavily into the barriers, carbon fibre strewing across the track before the car ploughed sideways into the gravel trap at the entrance to Tertre Rouge. There was enough damage to the barrier, and debris across the track, for action to be stopped. This time, with half an hour remaining, Race Control announced the session would not resume. In GT, quick times were set pretty much out of the box, with Richard Westbrook clocking Ford’s best time so far (3:52.496) to put the #69 GT third-fastest behind the #95 Aston (3:52.117 set on Wednesday) and the #71 AF Corse Ferrari’s Wednesday time of 3:52.235. 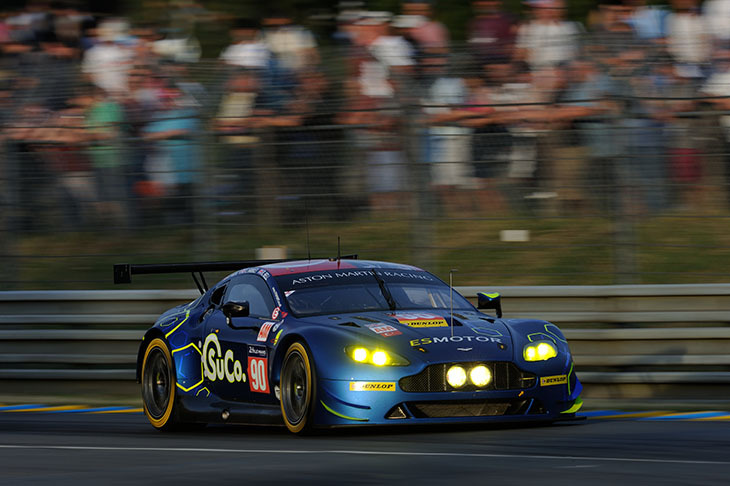 In GTE AM the times were as set on Wednesday, with Lamy’s Aston Martin #98 still holding provisional pole on 3:55.134. Following the red flag, the Gulf Racing UK :Porsche was returned to the pitlane with what appeared to be rear suspension damage. Once action resumed at almost 10 past eight, quick times were rapidly banged in around the same time Kobayashi was flying in LMP1. 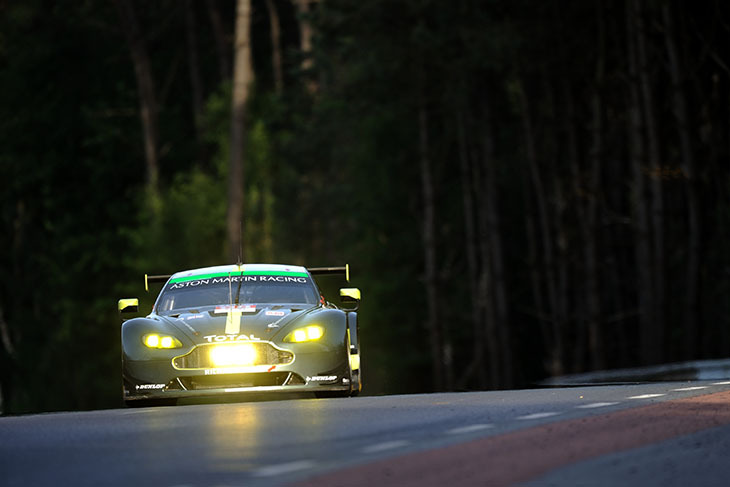 In GTE Pro, Jonny Adam managed a 3:51.860 to put the #97 Aston on top of the class. 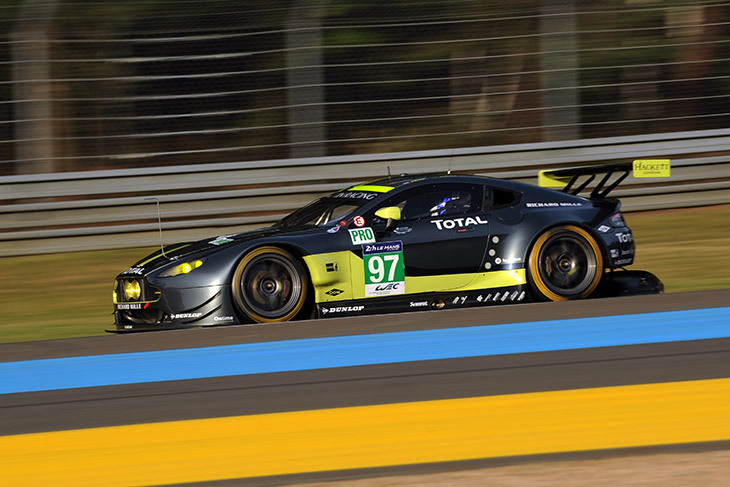 In GTE Am, the #98 Aston’s grip on P1 was shifted by first Matteo Cairoli (#77 Proton Porsche), then Fernando Rees (#50 Larbre Corvette) and then Dries Vanthoor (#84 JMW Ferrari, with a 3:54.543 to set a new GTE Am lap record). Elsewhere, the #66 Ford with Stefan Mucke at the wheel was circulating slowly with a puncture, having been reported as smoking and visiting the pits. Fischella then put the Risi Ferrari (which lost its times from Wednesday’s session) third in GTE Pro with a 3:52.138 to unseat the #71 works Ferrari to fourth. With just over 30 minutes of the delayed session to run, Lauda eclipsed Vanthoor’s earlier record-setting effort to put the #98 Aston back on top of GTE Am. A little later, Richard Wee in the #60 Clearwater Ferrari got beached in the gravel at Indianapolis, prompting a slow zone that temporarily kyboshed any improved laps. 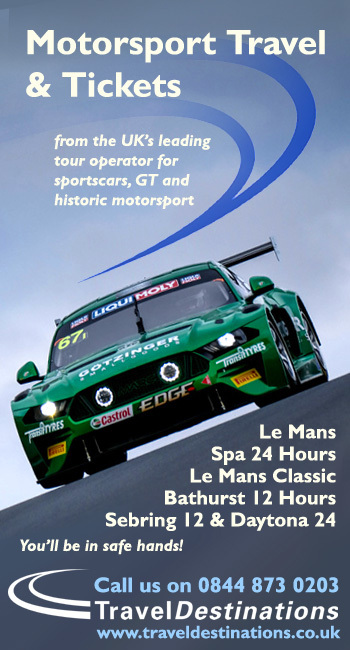 Once that had cleared, Euan Hankey in the TF Sport Aston became the latest holder of the GTE Am lap record, with a 3:54.319, swiftly eclipsed by Will Stevens in the JMW Ferrari with a 3:53.981. James Calado then reignited the works Ferrari threat in Pro by putting the #51 second on with a 3:52.087, just before the Panis-Barthez LMP2 car’s accident brought out the red flags and ended the session. That left the #97 Aston, #51 Ferrari and #95 Aston first, second and third GTE Pro ahead of the final part of qualifying, with the top three in GTE Am the JMW Ferrari, TF Aston Martin and #98 Aston Martin. 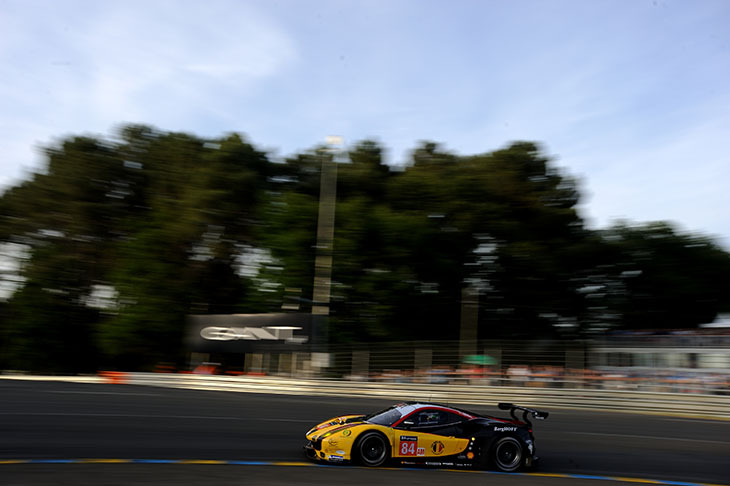 The GTE Pro lap record of 3:51.185 remained unbeaten.